Okay so let’s say you don’t have much knowledge about the countries of the world. That’s alright but you may not be able to excel with Stack the CountriesTM. No problem. Just press the Learn button and start studying the interactive maps and flashcards loaded with information including flags, capitals, major cities, languages, landmarks, and more. Once you’ve read up and learned all this info, it’s time to play the games. The main game asks a question about any of the aforementioned aspects of all the countries. You are given four choices. Select the wrong one and you move on to the next question. Select the right one and you are now given that country (to scale) to rotate and move around, then to place on a platform. The goal is to answer questions correctly to get a lot of countries that you can then stack from the platform up to the finish line. The game ends when you reach the line. You better be careful because the physics engine in this game is pretty excellent and you don’t want to make a stupid move and have all of your hard earned countries fall off the side of the platform. You also better hope for some large countries like Canada, China, USA, Russia, etc. 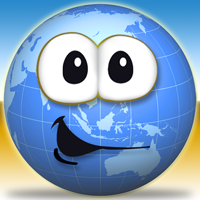 If you finish the level with a 60% or greater correct answer rate, then you earn a random country. Try to collect them all! If you earn certain amounts of countries, you can unlock two bonus games. The first one is Map It! in which you chose a continent then try to place the given countries in the right spots (there are no borders given to help you out). Get three strikes and your game is over. The other bonus game is Pile Up! This one is really hard, but you can chose an easier difficulty if you want. A stack of countries is given to you with more countries falling from the sky and piling up on top. If you’re on easy, this happens slower than if you’re on medium or hard (obviously). You are then told to tap a certain country, so you really need to know what they all look like to be successful. If you get it right, that nation disappears and the stack moves down. If you’re wrong, however, there is a few seconds of delay before the next prompt is displayed, allowing for more countries to pile up from the sky. You lose when the stack gets out of control and reaches a finish line at the top of the screen. All in all, Stack the CountriesTM is an amazing game filled with educational opportunities, mini-games, unlockable countries, and more. I really enjoy playing Stack the CountriesTM, as it is a game suitable for all ages. Surely worth the price! 10/10!